Quote of the day: "Don't ruin a good today, because of a bad yesterday"
Today's post is all about keeping things minimalist and clean. You've probably already noticed straight away that Nail-Beauty-Life now has a brand new layout, and everything is kept very minimalistic and very white, which then gives it that clean feeling. Although I'm still not 100% sure on the main heading on the site...i think it needs just something extra added to it, I'm just not quite sure what yet but hey that's something that i can work on! I didn't wanna pay too much for my first proper layout for my blog, so i had a look on Etsy and came across this layout called "Veda". Straight away i knew this was the type of layout for me and i thought at the price of £3.32 it was quite cheap. I know that others can and probably will buy the same layout as i did, but that didn't bother me too much as everyone puts there own uniqueness to there layouts in one way or another. Before adding it this blog, i pre-installed it on a tester blog that i have, and I'm glad i did as it took me a couple of hours to work out how to do all the menu sections aswell as all the side sections.....I'm not the best when it comes to all this HTML stuff haha. But i got there in the end and managed to figure it all out and got it all up and running in just a few hours. Next up is cactus's.......now i was out shopping in Cwmbran and was having a wander around Wilkinson's and came across these, they were £4.00 for a pack of 3 cactus's. I decided to buy these as i wanted some sort of plants in my room, but being a bad sufferer of hayfever, proper flowers were definitely out of the question as otherwise i would spend the whole time with itchy eyes and constant sneezing, and trust me when i say that isn't a good look. I thought these were rather pretty to be honest, unusual but pretty. I wasn't too keen on leaving the brown pots they are in uncovered so had a look around a few more shops until i found these 3 glass ramekin food pots, I found these in the poundshop so as you can guess from that they cost me just £1.00.....i do love a bargain haha. Just by putting these inside of the ramekin's, it makes it look so much better to look at. 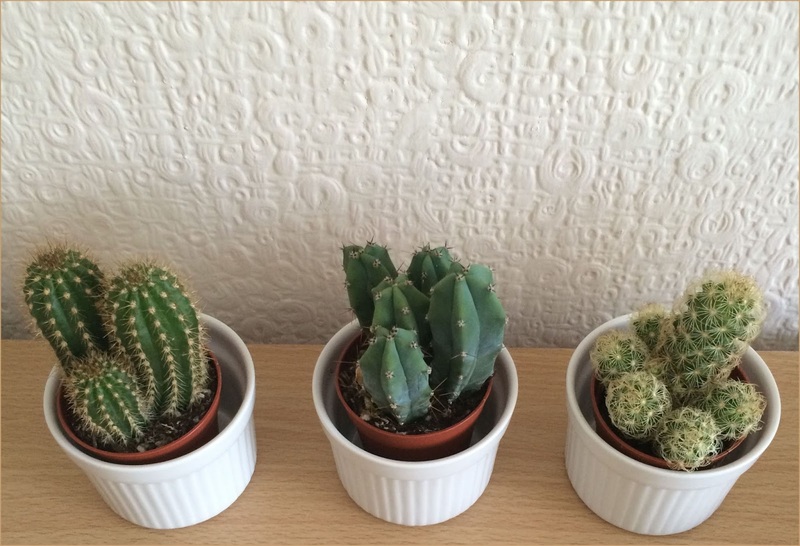 So for the 3 cactus plants and the 3 ramekin pots, it cost me £5.00 altogether, a bloody good bargain even if i do say so myself. 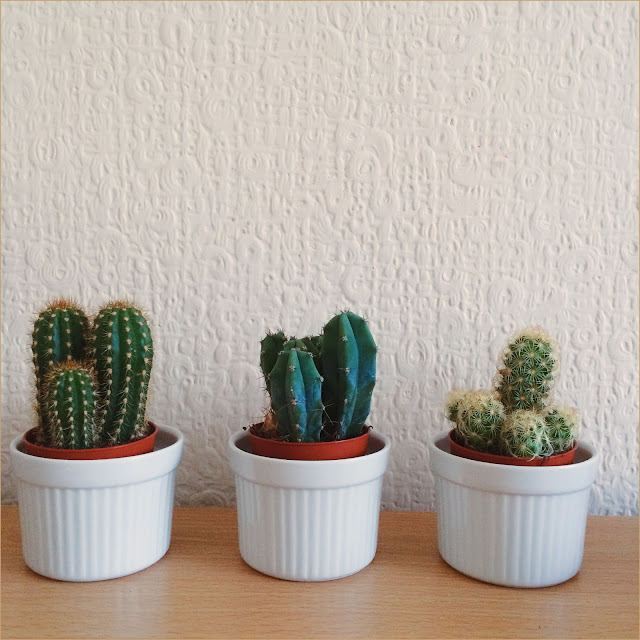 I admit i did have to research how to look after cactus's and how often they needed to be watered, and it all says they need to be watered just once a month. So hopefully i wont manage to kill these 3 straight away haha. Do any of you have certain plants or flowers that you keep on show? Is there anything i need to know about keeping Cactus's alive? Favourite blogs in the month of June!